In 2014 I made a New Year's Resolution to paint more models than I buy. This went reasonably well until around September I succumbed to the lure of cheap figures and bought a large batch of second hand models. I thought I was done for, but kept up the count anyway. Late in November I realised that I had actually managed to close the gap a bit. 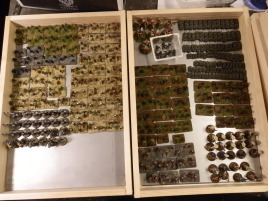 I quickly calculated that I needed to paint a little under 500 models in December to break even. Thus the 500 challenge was born. I started writing blog posts about it, I publicized the thing all over the net to maximize my shame should I fail and then I just went at it. This is both a retrospective how I made it and a collection of the blog posts related to the subject. I hope to inspire others and offer practical advice to those with a similar task. I don't mean you should necessarily set crazy goals just to test yourself, just that even seemingly insurmountable tasks may be overcome with determination, perseverence and a bit of planning. After all, if I can do it so can you. When I first posted that I would be doing this, some people guessed that I was taking time off work (or had none to begin with), was a sad loner living in my mother's basement, expecting immediate divorce or something similar... I do wonder why no one suspected me of being an independently wealthy dilettante with a few moments for painting before taking my private jet to the next Formula One race afterparty on my yacht with supermodels clinging to my legs? But alas, I must disappoint them. I am gainfully employed fulltime and married with children. I'm blessed with a short commute. It takes me max 45 minutes per day. I work standard hours with no need for overtime. The kids are teenagers and neither need nor want my constant attention. Being married for 20 years means you don't have to be joined at the hip 24/7 to know you still love each other. I have a dedicated hobby room, so I don't lose any time setting up or putting away the painting equipment. I don't need more than 6 hours of sleep. But that's it really. I understand life is different with small children, long commutes etc. -- but I don't think my situation is all that special either. I worked an estimated 131 hours on the project. Sounds like a lot, doesn't it? A standard work month is 147 hours I think, so it was a couple of days short of that. Actually, the combined total of work plus painting is pretty much dead on with working 70 hour weeks. That leaves 9,5 hours for everything else. So I used less than half my free time for painting. Actually, much less than that considering weekends were not accounted for. Some people do work 70 hour weeks all year round. I am not advocating that lifestyle nor do I want it for myself, but there is a very distinct difference between "impossible" and "I don't want to go that far." I don't mean necessarily doing the exact same thing I did. But I think these guidelines will help you take the "in" out of any seemingly insurmountable task. I think this is the most important advice I have to give. Make it a habit. Do something every day. It doesn't have to be a lot, I didn't slave away on Christmas Day either. But I did do something. We are creatures of habit. The moment you let yourself slip, you are breaking the habit and it is that much harder to pick it up again. You shouldn't think about doing it any more than you think about brushing your teeth today. Just do it. And if you don't brush your teeth every day -- make that a habit too while you're at it, ok? Your dentist may hate you but everyone else wins. Take out the easy targets first. It's not chance that I selected the modern micro armor as my first new batch. Starting with the easy stuff will let you get into the routine of working and also provide positive feedback when you see stuff actually being finished. If at all possible, split the work into reasonably sized batches. This will provide positive feedback as above, but it will also let you improve your routine with each batch if you are doing lots of similar things. 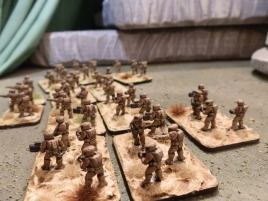 I did several batches of 15mm sci-fi infantry and I was able to tune the process closer and closer to perfection with each one. Set clear goals. Know what you want to do and set out to do it -- and just it. I knew the level of detail I wanted to produce before I set brush on the models and therefore I didn't lose any time wondering whether I should shade the belt buckles or not. Perfect is the enemy of good. You are aiming for a goal here and you should keep the ultimate goal in mind all the time. Sidetracking can lose the mission: it may be the best shading in the history of belt buckles, but it doesn't really count for anything if the rest of the syntagma is still unpainted. Armies don't march for long without supplies. Take stock of the supply situation before starting and monitor it constantly. I ran out of several critical supplies during the process, but I was always able to restock before hitting rock bottom and losing actual working time due to shortages. Be prepared to change your plans. 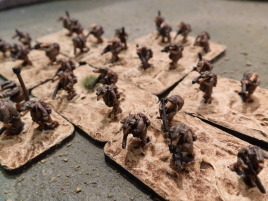 I switched to desert bases at one point because I ran out of the basing compound I had been using previously. That was a choice I made when I saw jar would run dry. Pace yourself. Settle for an amount of work you can handle. I did one 7-hour stint on a weeknight, it was too much and the next couple of days suffered for it. If you really need to pull an all-nighter, it should be the last night. The following are the unedited daily blog posts I made. I thought about editing them and removing the stuff not directly related to the painting, but in the end I decided to keep them as is. It should be noted that I wrote these log entries on the following morning. Thus "yesterday" and "last night" refer to the actual day I'm writing about while "today" and "tonight" refer to future plans. Procrastinating never finished anything, so I started the task off yesterday by evaluating what could be painted. The 15mm scifi troopers are an obvious choice, since I never even packed them away -- they're sitting right there cluttering the desk. I picked out two baggies at random and cleaned a total of 80 troopers. Then I dug through the archives for my old micro armor collections. 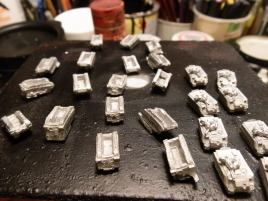 The moderns box happened to surface first, and I found 25 Vietnam era M113 variants which I cleaned. What is that? Cries of foul from the back row? You must be new to the game. I'm not changing anything for this little escapade. Everything still counts as one (except microscale infantry, which I probably won't do for this anyway), and they're done when they're done to the usual standard. I won't skimp on quality or change my processes just for this -- but I will be sensible about picking the subjects. Work also continued with the semi-finished men-at-arms (pictured), since they are already started they need to roll off the assembly line. But as I prepared to prime the new figures, the primer can gave a pitiful wheeze and died out. And the stores were already closed of course. Bummer, but only a minor setback. I need to go get a stash of primer and varnish later today. Last night I picked up more primer and varnish and managed to work for about five hours. This is more than the usual 2-3 hours per night, but nothing really extraordinary. After finishing I watched a few episodes of Zeta Gundam to clear the palate. I managed to get the men-at-arms (pictured) pretty much done, which isn't really that significant in numbers, but it clears the desk for other stuff. I'll just finish basing tonight and then they're done. 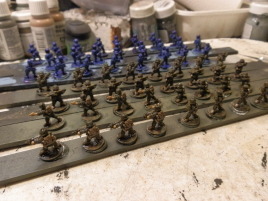 Armed with the new primer, I also primed the 80 troopers and 25 APCs. I'll be starting them tonight. And there's also the Apaches and the Mexicans. Something a little more important today. I really didn't plan for this, but when someone offered to donate money to charity if I can make, I thought what the heck, let's do this. But this time around they are doing something about it. First of all: DO NOT send me any money. Send me the amount you pledge to donate if I make it. Put it in the comments, use the feedback form, email, whatever. I'll post the updated total amount in the daily blog entries. If I manage to paint all the 500 models before 2015, handle the donation directly with Red Cross. Another 4 hours or so working. 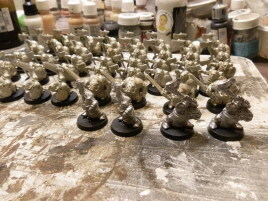 I finished the men-at-arms, there'll be a photo-shoot tonight and pictures up tomorrow. I decided to clean out the modern micro armor box, prepped my BAOR vehicles and found another bag of M113 variants (zippos this time). That came to a total of 82 AFVs, plus an armored train engine which I decided to paint mostly so it wouldn't be feel all alone and abandoned in the big empty box. 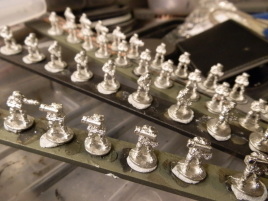 I'm not actually sure painting micro armor is all that much faster than painting 15mm infantry. 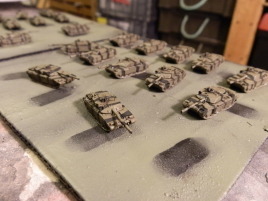 The thing with the vehicles is that they essentially need to be undercoated twice, which in practice means priming them takes two days -- it's way too cold to prime outside and I really don't want to work in solvent fumes. As this project proves, I have far too few braincells still functional as it is. Finished off the evening watching a couple more episodes of Zeta Gundam. Only two more episodes left and quite a number of the main cast are still alive. I'm eagerly anticipating the coming bloodbath. In Zeta, basically everyone dies or worse. It's my second most favorite Gundam series. 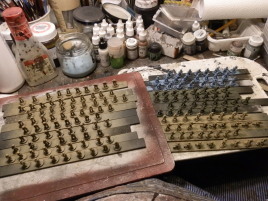 I'm having a dance class tonight with the wife, so I doubt I'll get much else done besides finishing priming the tanks. 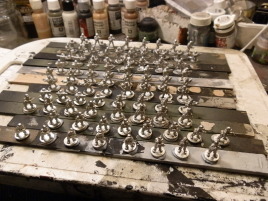 That puts me at a little over 200 figures primed and ready to paint. And the realization dawns on me that that's still under half what I need to do... at least I now have enough basically green models to fire up the airbrush. Now, are the A-codes New Anglians form GZG? Maybe... but anyway I prepped another 35 of them. Unfortunately a few were so badly miscast I wrote them off as total losses... maybe I'll make casualties out of them or something, but if the mold halves have been misaligned by 1mm or more on a 15mm figure, it's not really worth it anymore to fix it. Had a few words with Phil and he confirmed that my BAOR microtanks are old Scotia models I bought from him... a while back. Next it's time to fire up the airbrush. Finished the night by watching the rest of Zeta Gundam. Katsu dead, Reccoa dead, Jerid dead, Henke dead, Camille mindblasted, Emma dead, Paptimus dead, Char dead... no, wait, was that an _open_ cockpit hatch on the wreck of the Hyaku-Shiki? Well, I guess you could say Quattro died. Next on to ZZ. Even the Hyaku-Shiki grew on me. You just gotta respect a guy who goes incognito with a pair of sunglasses and a giant golden robot! In case you were wondering about this whole Gundam thing (what have you been watching all these years then, NFL or something?) I just on this fabulous piece of work on the net: Gundam Sousei -- totally worth a read, even if you are not into Gundam it's a great insight into animation production. P.S. I'm putting all the 500 figures in a separate box you see here. That'll be easier when it comes to photographing them all together. Sorry, no new pics this time. You'll have to do with this teaser of stuff that's coming shortly. Managed another 4 hours of work last night before the family demanded a pizza and a movie (Aliens, which did not suffer from Blu-Ray as Alien did). 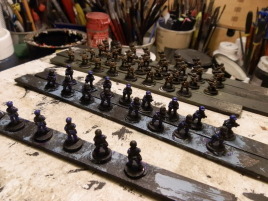 Fired up the airbrush and proceeded to basecoat nearly all the 15mm and microarmor items currently being worked on. I used the Vallejo colored primer (US Olive). They are really nice and a good value point compared to the small ModelAir bottles, but I think all the tones are really too dark for the scales I'm usually working on -- especially considering the items will be washed after the basecoat darkening them further. So I did something I almost never do -- I mixed paints. Luckily when those annoying dropper bottles inevitably dry out, they can be cleaned leaving functional dropper bottles. I took one and mixed about 20% white with the olive. I think the result was pretty good, but you'll see it yourself in a couple of days. 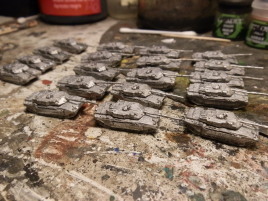 Basecoating took about 25-30ml of paint, so if I had been using the small bottles I probably would have run out in the middle... then I managed to paint camo on some of the BAOR tanks, but that work will continue today. On the plus side, the break meant I had time to actually fetch image references for the zippos. 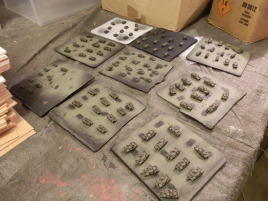 Next I hope to get all the tanks washed and move onto the infantry. P.S. Today's paper actually had a story about the Ebola vaccine. Looks like it's proceeding nicely so this is not just shoveling back the tide. It's not too late to pledge. Those nice batsies need your help! Because if they can't get the vaccine to work, the next thing they'll try is killing all the bats. No rest for the impulse control challenged -- managed another 4 hours of work yesterday before starting the Independence Day celebrations. Only three more years to the big one hundred years party. 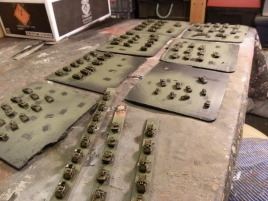 Managed to paint camo on all the BAOR vehicles and other small details such as machineguns before sending them off to the wash. I'll do the tracks next, a little drybrush and then they're pretty much done. Working with batches this size is deceptive, because everything adds up so quickly. You spend 10 seconds picking each one up to check something and BANG, you've just spent 20 minutes. I mounted part of the tanks on sticks for painting, but it's really not an ideal solution because the blutac tends to hide part of the tracks. Since they are hollow, maybe I should prepare mounting sticks with studs? 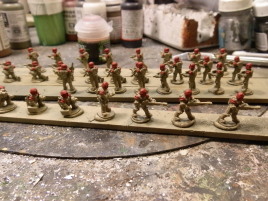 The 15mm infantry is next in line, I hope to get some real progress with that today. P.S. Watched the best Icelandic movie in the whole wide world with the family last night. You should too, it really is good. First hundred down! I managed another six hours of work yesterday and finished the micro armor. I'll get better pictures once the varnish has dried. 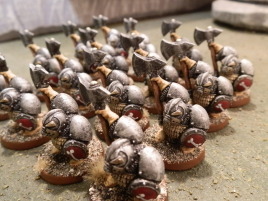 I'm leaving these unbased for now, largely because I really don't have an established basing scheme for micro armor. I've tried basing them singly but I don't think it really works for my current needs. 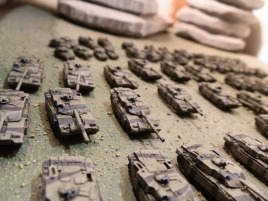 Back in the day I got micro armor as a cost saving measure to play skirmishy games with individual tanks -- I pretty much wanted to play Steel Panthers (the original one) with miniatures. These days I'm more inclined to think of micro armor in context of a larger scale game, with perhaps multibased platoons. In micro armor, that's doable. I just have to find rules and decide on a basing scheme. I probably should get Modern Spearhead for reference. I have the WWII rules, and I quite like the general feel despite the fact that they don't quite work. You see, Spearhead is a bit of a one trick pony. Everything revolves around the map/command system. It's a good trick on principle, but when it doesn't work you're left with pretty much nothing. The problem is that it's nigh impossible to get accurate maps of the tabletop -- and when the maps are not accurate, players start to interpret their planned movement arrows to their advantage and everything turns to mush. I've think about adapting the grid system from Peter Pig's Poor Bloody Infantry rules. With terrain features designed to fit the grid, you might get away with not marking every square. The human eye is pretty good at halving things. 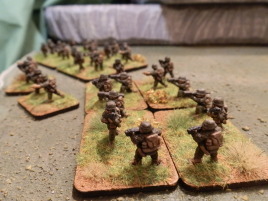 As you can see, there's also progress with the 15mm infantry. 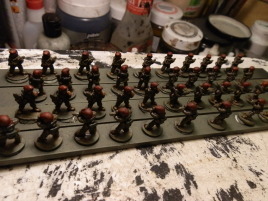 I can hopefully get the first platoon varnished today. And I think I have a solution for the basing process too. 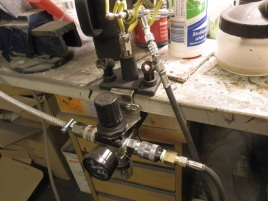 Another four hours down the drain... eh, slaving away at the workbench. 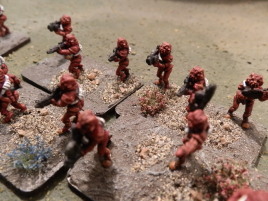 I got pictures of the micro armor and work continues on the batch of 15mm scifi troopers. The first platoon is ready to be based and the two next ones aren't far behind. What's positive though is that I'm far too busy to even contemplate buying any new miniatures. I did take a look at Modern Spearhead, though. Even though it's supposed to be back in print, I couldn't find anyone actually selling it. And looking at a couple of random scenarios I pulled off the net, it seems to be aimed at roughly 100 stands per side level of gaming. That's way more things to move than I like. Maybe I should give Cold War Commander another look. 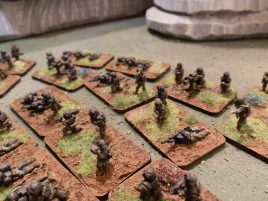 We tried to play it, but perhaps the problem was the Vietnam era -- I'm getting the feel the rules don't really work with extremely infantry heavy forces like the Viet Cong. At least all the other examples I've found have been far more vehicle heavy -- or maybe it's just the normal anti-infantry bias in gaming. I'm glad to see the Ebola campaign pledges are picking up a little bit. Worked for 5 hours last night. I was actually planning to pull an all-nighter, but work progressed so well I decided to call it a night instead. And quite frankly I needed to sleep. Trying to watch some more Gundam ZZ just caused me pull some ZZZ's... Three Axis Gaza-D's were destroyed but I have no clear recollection how that actually happened. 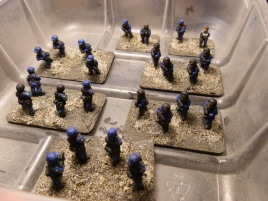 The first platoon basing went smoothly. I adjusted my basing process and now it's working pretty nicely. The key is not glueing in all the figures at the same time. I'll probably write a short tutorial on that when I have a little bit of time. 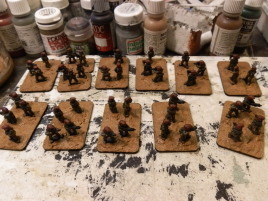 I also managed to get the other two platoons all the way to varnish stage, so I'll be basing them next. Doing the basing I realized one thing: the basing process is actually rather slow due to all the drying times involved. I leave the varnish to dry overnight, then I leave the basing compound to dry overnight, then I might leave the base wash to dry overnight... you get the picture. I really like the Vallejo basing compounds, but they do take a long time to dry. 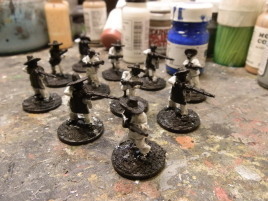 Next I should be getting around to the Mexicans and Apaches and I should also start prepping the next batch of 15mm troopers. I think it's time the Tan army got some reinforcements. Boo-yah! 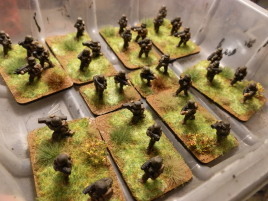 First platoon of 15mm finished last night. I'm just letting the glue dry and I'll take more pics tonight. 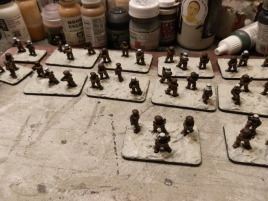 The other two platoons are also in finishing stages and should be finished tonight. I managed another four hours at the workbench and I've now introduced another statistic to follow, hours worked. I was planning to count the hours at the end anyway, but keeping a running total makes it actually easier. 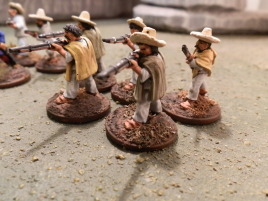 Having based my 15mm figures, I turned to the Mexicans and managed to put a basecoat and wash on them. I will do them a little simpler than the Apaches, which will get the full 3-color treatment. Nothing less will do for Mr. G. and his merry fellows. I also did a quick tally of the remaining figures. Once I've done everything currently in the works, the total should come to a little over 250 figures. 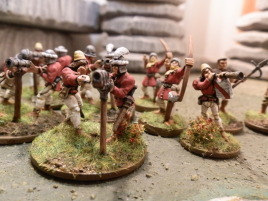 Then I have 144 more of the 15mm figures as obvious choices to paint. I am not running out of miniatures. I could probably keep this up for a year before seeing any significant dent in the lead mountain. But I am running out of immediately obvious choices for painting. 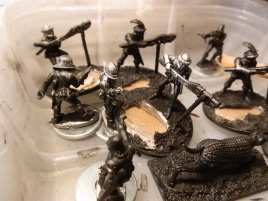 To combat this, I rifled though the stocks last night and picked a bunch of Chronopia figures to paint. This painting speed is also starting to stress the resources. I've already gone through one can of primer and one can of varnish and my Agrax Earthshade and Vallejo Brown Earth basing goo are just about finished too. I do have some spares, but the holidays are coming and actually sparing the time to go shopping for replacements is a bit difficult -- I basically spend all my spare time at the painting desk. I probably should order some more supplies while there's still a chance of them getting here in time. Happy Birthday Me! Yesterday was my birthday. I made some chili con carne, vacuumed the house and painted for six hours. Sounds a bit sad, doesn't it? Well, it's not really. When you get to my age, it's not such a big deal. Another day older and deeper in debt... and actually we just decided to move the celebration to the weekend. Finished the scifi troopers last night. As usual, they're still drying so I'll get pics tonight. 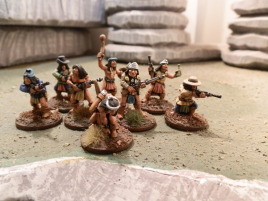 That meant I could turn my attention to the mexicans and I also managed to paint skintone on all of them. 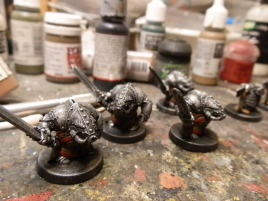 The peons are actually pretty simple figures so there's good chance I can finish them tonight. The officers will take a little more attention before it's Mr. G's turn. I also cleaned and prepped two platoons of 15mm aliens. One of them is this set of geezers with long snouts that for some reason seems very British to me. The other is a set of bug aliens from GZG that is actually a bit meh, but whatever, they'll be simple enough to paint. White Christmas! Well, it's sleet actually so I doubt it'll survive the day -- but it's the thought that counts, right? Why did that immediately remind me of Kevin Sleet? I haven't had my coffee yet, that's what I'll blame it on... and no, I don't mean the air conditioning inspector. Anyway, I slaved away for 7 hours last night, which was quite frankly too much in my already tired state. But I did manage to get the mexicans to varnishing and remind myself why I don't like cordage. 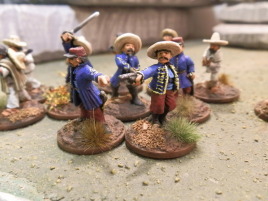 The mexicans are as good as done, just a few minor basing details left. 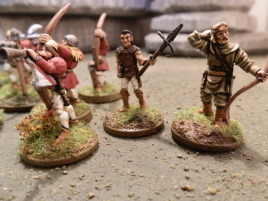 That is the bonus side of 28mm figures -- they're much snappier to base. P.S. Still not too late to pledge. Just drop me a line and join the merry band. Halfway there, living with a painter... Or something like that, was it? This wasn't planned, it just sort of happened. I finished the Mexicans and bam, we are halfway done! Basing them was a doddle as expected. I did get Mr. G and his merry band started too, but mostly they just got their boots done (I often work bottom to top and inside out). Instead I concentrated mostly on the two new batches of 15mm figures, which are aliens this time. Anyway, the snout aliens seemed so British to me I basecoated them in British Denison brown. They are still pretty much in that state as I concentrated on the other bunch -- some sort of bug aliens from GZG. They sort of reminded me of Kafers from Traveler 2300 / 2300 AD, but GZG never held the Traveler license as far as I know, so they can't be that, right? I've been doing so much dreary and drab stuff lately I decided to brighten things a bit and painted them brightish red with an orange twist. They don't seem to wear a whole lot of equipment, mostly a bandoleer, so I did those in white for contrast. Working on that for another six hours they are done, painting-wise. I'll just have to base them. Let's see how much of the others I can manage. In other news, the storage box is filling up. I'll need to take another into use. 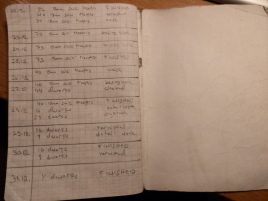 And I'm on the last leaf of the painting diary, which has served me well since 2006. I'll enter the diary updates soon as well, promise. I took it at a leisurely pace and worked for another five hours. While nothing was finished, things were progressing steadily. The bug aliens got to basing and while I ran almost completely out of Vallejo Dark Earth, there was enough to get these guys stuck in the mud. Once the goo has dried, I'll just add a few final basing details and they are done. Likewise the snout aliens got their bit of love. I got all the basic colors down and gave them a wash. With some luck next time I can get them to varnishing next. Got started on the skintones for Mr. G and the boys, but there's still quite a bit of work there. 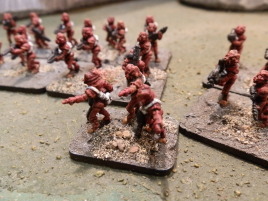 In addition, I managed to find another two bags of 15mm troopers. 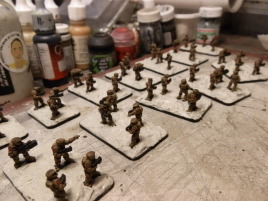 I'll paint the ones on the desk for the tan army and then I'll think about what to do for the remainder of the 500. Ok, high time to update the painting diary -- let's get on with it. Finished the bugs last night, getting more pictures today as usual. The snout aliens went into varnishing and will be based next and I even got a fair bit of work done on Mr. G and his fellows. Not bad for another four hours of work. In case I forgot to mention, I did order more supplies. Now it's just a question of them arriving before the Holidays. The only thing is that pretty shortly I'm done with everything currently in the works and that still leaves about 180 figures to do. It's back to scraping then, I guess. In other news, after some sidetracking I got back to reading Tameichi Hara's memoirs. It's a fascinating book for anyone interested in naval combat. Perhaps my Java project gets rekindled with it... andf I have some of the ships somewhere in storage. The bugs were photographed and entered into the hallowed halls of the storage box. I squeezed in another five hours at the painting desk and managed to get the remaining items onto the home stretch. The snout aliens got the basic basing. I had to switch to Vallejo Sandy Paste, because everything else had pretty much run out. 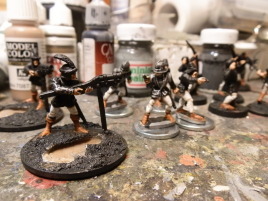 I'll finish the basing next and then they are done. Mr. G's band was progressing so nicely I decided to put in a little bit of extra effort and basically finished them. 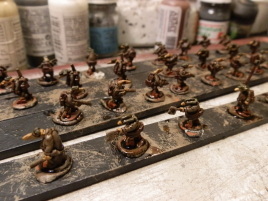 Once the varnish dries, I'll just add in the last few bits of basing and then they are done. I have a few Christmas errands to run today, but I think I'll manage that anyway. Which means it's back to square one, scraping and cleaning figures. Plus I have to spray a bunch more bases, I ran out of those as well... on the plus side my new supplies are waiting for pickup at the post office. On the entertainment front, I managed a few more episodes of ZZ. I had thought the Hamma Hamma was my favorite from ZZ, but after seeing the Bawoo in action I'm not so sure anymore. Red ones just go faster! P.S. I just read in the paper this morning that the Ebola Campaign is setting up a clinic in Sierra Leone and aid workers are travelling to the site as we speak. Or read/write, as the case may be. Managed another four hours of work last night, finishing Mr. G's merry band and the snout aliens. As the Dark Earth had run out and Brown earth was running seriously low, the snout aliens were transformed into desert dwellers with Sandy Paste. This I cleared everything off the desk, so it was time to start cleaning more figures. I managed to scrape two new platoons of scifi troopers who will be getting primed later today. That still leaves 99 figures to do. 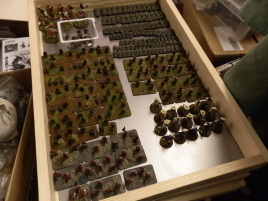 The first storage box is now full for all intents and purposes. I started filling the second one. After the project I'll divide them a little more sensibly, but for the time being this is a good way to keep all the project figures together. There will be a photoshoot for all of them in the end. On the ZZ front the story seems to be finally picking up the pace a little bit. 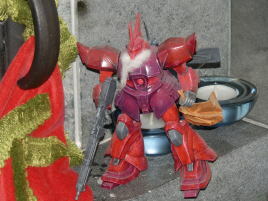 Elpe Puru entered the picture and Haman is about to invade earth (always a good plan). Though I wonder how come there's gravity inside Axis given it doesn't spin like the colonies? Glemy Toto is also starting to grow on me. Haman's too uptight and Mashymre and Chara are just crackpots... though a lovable crackpot in the first case. Holy shoulder cramp, Batman! I took it easy last night and worked only three hours after vacuuming the house. In fact, I didn't even touch a brush. Instead I cleaned and prepped another 89 scifi troopers. This leaves just the Slammers and some odds and ends (civilians, vehicle/gun crews etc.) 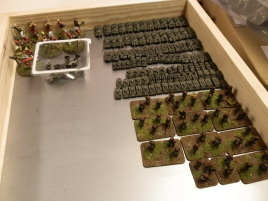 in the 15mm infantry bin, which basically means that source is exhausted. 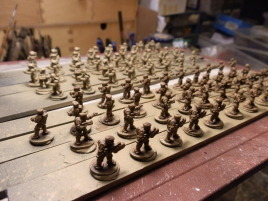 Doing some basic math we see that 80 + 89 = 169 figures currently on the workbench. Not that much progress, but well prepared for the next stretch. And I had some time with the family, watch another few episodes of ZZ (man that Granada story came out of left field, I had to double-check I was really watching double-zeta) and got to bed early. In other news I ordered the new Gundam manga compilations. I thought they were a bit steep when ordering but now that the books are actually arriving I'm flabbergasted. These books are fabolous and an absolute steal at the prices you're getting them for. 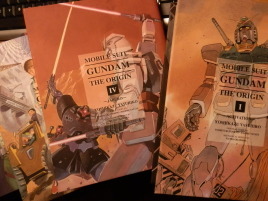 If you have any interest in Gundam at all, get these! P.S. Ran out of black primer again. That's three full cans of primer and one of varnish gone in this project. I need to pop in the store today to get some more before everything closes for Christmas. Time for the mid-season recap where we rehash old footage and bring new viewers up to speed! To start at the beginning, I've been making hobby related New Year's Resolutions for a while now. 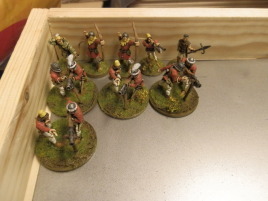 This year I decided to paint units from my Flintloque and 19th Century boxes, which was pretty typical for one of these things. But in addition I decided to try to paint more than I purchase, to reduce the growth of the lead mountain. This went relatively well until about last September when my resolve crumbled in the face of a large batch of second hand figures. 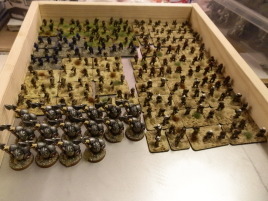 It contained nearly 700 15mm figures, putting me squarely in painting debt. I thought I was done. But I kept the count anyway and I noticed I was actually making a little progress anyway. Thus I calculated I still needed to paint a little under 500 figures in December to break even and keep the resolution. And so this crazy project was born. I've logged progress on every day (see the article list on the left) with pictures. We are currently over halfway done, but still with a lot to do. A generous reader offered to donate to a charity if I made it. While this wasn't initially a charity drive, I decided it being the season of giving and all that to give everyone an opportunity to join in. We are collecting for the Red Cross Ebola campaign (see link below). To join in, just pop a message with your pledge to me. I'll post instructions once we are done (you will be donating directly to Red Cross). And why do you do the mid-season rehash? In addition to the reasons outlined above, it's also because production schedule has fallen behind and you don't have a full new episode. 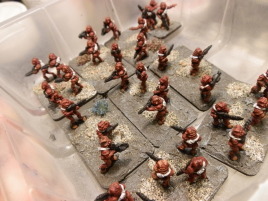 Nothing serious, I just only worked for two hours priming the remaining 15mm troopers. I'll be giving them their base colors today. I just started my Xmas break, which means no work (the paid kind) for a week but on the other hand quiet time to be spent with the family, so probably painting-wise pretty much the same. With twelve days to go, we are not home free yet but well in schedule. Tomorrow some actually new pictures, promise! I whipped out the old airbrush, mixed a custom basecoat and went a-spraying! 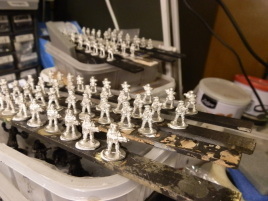 Then some bad news: on closer inspection seems I have either miscalculated or managed to misplace a stick of figures -- there's only 160 figures on the workbench right now. Basecoating the batch of figures took about two hours. PLUS 45 minutes to clean and debug the airbrush. Airbrush is a good tool for some tasks, but I'm really not getting the fast aspect. I basecoated one set of figures with a regular brush and it was just as fast or faster -- and with zero technical downtime. My HP-C is probably too good a tool and too finicky for the jobs I'm usually doing. Maybe I should get another one with a wider nozzle, 0.5mm perhaps. 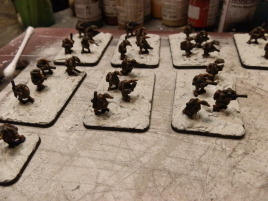 After the basecoat had dried, I proceeded to work on two platoons. One will be jungle fighters and the other will be a security detail/SWAT team in blues. I got both of them to the wash stage, though in practice that means a whole lot more progress for the jungle guys. In any case, I'll get one or maybe even both of them to varnishing next, and then it's three platoons for the tan army in light brown. Total work time about five hours. In other news, I've been reading more of Tameichi Hara's book and just finished the section on the Java Sea battles -- a very interesting viewpoint, especially compared to the western ones. Despite the final result, it was actually a pretty close run thing and serious blunders were made on both sides. Western accounts typically also fail to mention that the Japanese commander and his aide were both transferred to desk jobs after the battle -- hardly a reward for superb performance. Let it snow... The weather has turned to freezing (barely) temperatures and we got a little bit of something vaguely snow-like. The forecast promises more of the white stuff, so I guess there is a chance for a white Christmas after all. In general the project is very much on schedule and even if there is a slight dip over the holidays, I should have no trouble finishing this in time. One of the final batches (pictured) is vaguely familiar, but I just can't place them. I would bet they are from some old scifi movie or TV series, but I can't pinpoint it. The helmet shape is very distinct with a large two-part visor. Maybe you recall where they came from? P.S. Just as a reminder, this is going on all the way to the end of December. I will continue to put up daily updates all the way to the end. White Christmas! I started this morning by plowing the driveway. It's still a fair bit off snowshoeing weather, but at the very least Christmas will be white. There's no way this amount will disappear in a day or two. 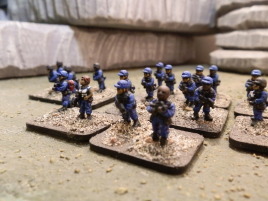 Put in another six hours, finished the jungle fighters and the security detail -- more pictures of them as soon as the glue dries -- and got a fair bit of work done on the power armor troopers and the weirdly familiar ones. This leaves just one platoon in just the basecoat. So instead I splurged on ZZ, finished the desert arc and the Dublin colony drop. Just when I talked about the heroes always getting away without a scratch, limbs start blowing off and in addition to Puru biting the dust (well, that was sort of expected), Hayato is killed off nonchalantly. Whew, compared to the first ten episodes of this series the tone is completely different. Merry Christmas! Saint Gelgoog wishes pleasent holidays for all the nice robots out there! Work is progressing very well on the power armor troopers and the weirdly familiar ones. The only real question is when I can slip away for long enough to actually finish their basing. If it doesn't happen today, it doesn't happen. I have enough slack in the schedule to take a little time off. 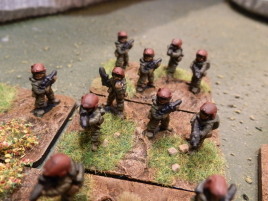 They could pass as modern figures quite easily, though the mix of US style helmets and FAMAS rifles is a bit odd. Also watched a stretch of ZZ while the ham was in the oven. Something weird about it. The Dublin stuff was strong, but now there's pointless filler episodes almost equal to the start of the series. I know there's a lot to come, but we are running out of episodes... It's starting to appear Tomino saved the true climax to Char's Counterattack, which bears rewatching. Yeah, I pretty much slacked off. However, before all the hooplah started, I managed to do a little work on the bases. Call it an hour, being very generous because it's Christmas. There is no great panic, though. I had this figured in and I should be getting a little more work today and probably back to regular schedule tomorrow. 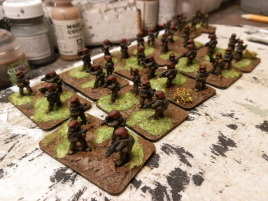 The two platoons in basing are just waiting for the very final touches and then they are done. Then it's just the final stretch. In other news, as you know Santa lives in Korvatunturi and therefore I got my presents already last night. Those of you living further away will be getting yours today most likely. 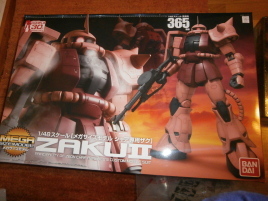 Santa must have seen my hobby plight and brought something to tinker with next year: A brand-spanking new 1/48 scale Zaku mega kit! You can see the 365 printed on the box? That's the height of the model once finished. And actually the most expensive thing about it is having it shipped from Japan. This should be a fun project. Happy holidays everybody! Take it easy with the ham (or turkey), we'll be back with more updates tomorrow. The best way to make sure you get the presents you want is to buy them yourself. 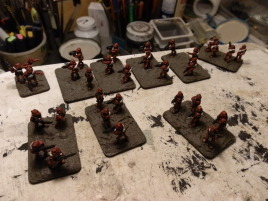 It proved harder than I had initially thought, but I did manage to slip away for half an hour to finish the two platoons on the workbench. I'll say this comes to a full hour combined with the previous day and keep the hour log where it is. Truth be told, the actual effect of these two short work periods is not that great for the final production. It is more of a morale thing, having worked every single day. And it also means I don't have to post "didn't work today" updates. The guys in the red helmets are weirdly familiar, but I just can't place them. Can anyone help and tell what they were possibly inspired by? This means we broke another hundred and are actually down to the last 50 figures. 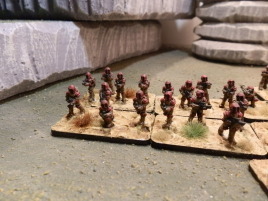 There is one platoon of 15mm troopers left in the queue (there are some others left in the bin, but I'm not doing them now). 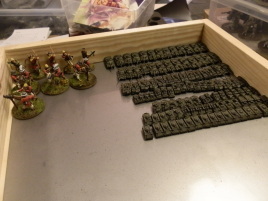 Then the final few will have to be 28mm again. No new pics, sorry. There's just one in the camera and I didn't bother transferring it, so you'll have to do with these for now. I'm slowly getting back to work, managed to slave away for three hours or so. This brought the final platoon into wash stage and instead of starting something new I decided to call it a day instead. It should be easy enough to get those to varnishing today and then it's just a question of basing them, which will take a couple of days due to drying times. 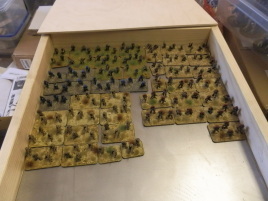 That in itself means I can't really start any more batches of 15mm figures even if I was so inclined, so the finish line has to be crossed with glorious 28mm. Even then I'll have to account for the primer drying time and fumes, it being winter and all I can't spray outside. In practice this means I'll have to prep as many figures as possible today and then make do with them till the end. Oh well, the new Game of Thrones season just started. Old news to most you probably, but I've stayed with the local schedule and it's time for the fourth now. That should keep me occupied for a while. The only irritating thing about Game of Thrones is that I'm not sure if they'll manage to end it properly. I hate unfinished stories. That's the reason I haven't read the books. Knowing there's no end in sight keeps me from even starting. Back on track! 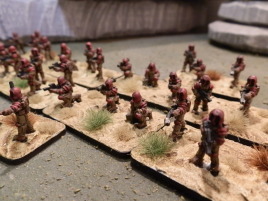 Worked for six hours and get desert warriors to basing stage. They should be finished later today. 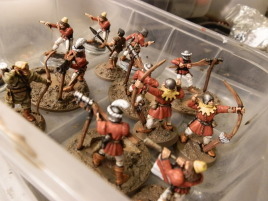 One benefit of weekends is that even though the actual hours worked isn't that much greater than on weekdays, I can split the work, for example varnishing the figures in the morning and then taking them to basing in the evening once the varnish has dried. I hit an interesting resource problem, though. I ran out of podcasts. I listen to gaming podcasts while I paint, and in a hundred hours of painting you go through an average of one hundred hours of podcasts... except basically all the podcasters are taking a Christmas break now, the lazy gits, and new episodes are few and far between. Managed to find a few updates for the old 'pod, but running out is a real possibility. In the silence I'm liable to start singing myself, and no one wants that. A few words about schedule. There's technically four days left. But I'm going back to work tomorrow morning and there are some plans for the New Year's Eve. So in practice that leaves three days. 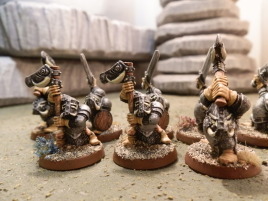 How many dwarfs can you paint in three days? Let's see. P.S. Still a little time left to pledge! Just drop me a note. The Countdown Begins! We're down to the final ten figures! And it's a nice crispy 15 degrees below outside. Ah, the sweet smell of winter finally! Now all we need is another foot or two of snow and it'll be prime snowshoeing season! 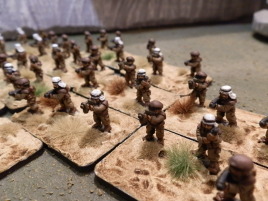 I finished the Desert Warriors, completing the 15mm figures for now. I guess I could have scrounged together another ten to meet the quota, but that's just not the way things are done around here. I'll do the rest when their time comes. 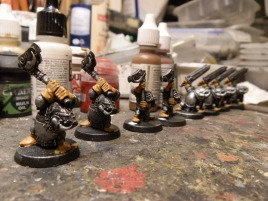 I put in another seven hours working on the dwarfs, progressing pretty well. No, I don't think I'll do all 44 of them in time, but at least I won't be running out of stuff to paint. I split the batch into lots of identical figures -- for once the limited pose variation helps -- and concentrated on the first set of 16 figures. With a bit of luck, I'll be able to get them to varnishing today. Then it's really a question of writing the final reports. The normal yearly report, resolutions retrospect and now this too. I also thought about writing a short tutorial on the 15mm technique, maybe that would be useful to somebody. And I probably should compile these daily posts into a more reader-friendly format for posterity. And it's snowing again! Perhaps the weather man is reading this blog. Or it could be a coincidence. 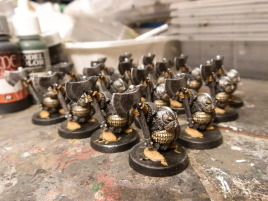 I sneaked in another four hours last night getting the first batch of dwarfs to varnishing. It's just a question of getting some glue on their bases tonight and we're basically done. But would I stop there? Why would I stop there, especially since there are still 28 juicy dwarfs all prepped up and ready to go? No, I started on the next batch. With a bit of luck I might get them to varnishing today. If it's not varnished today, it won't be finished by the end of the year. But they'll be done alright, because 2015 will be the year of... oopsie, let's not get ahead of things. In other news, I had thought about binging on Game of Thrones, but instead I started playing Tomb Raider and lost track of time... Yes, I realize it's not very hot news item anymore, but it was a reasonably priced download for the PS4 so I grabbed while I was setting the system up. The game looks great, but I'm not quite sold on the gameplay yet. I could do without the QTE-based gameplay, the combat is nowhere near as tight as in Nathan's games and the platforming (traditionally Lara's forte) is at least so far a bit lacklustre. Is there a better way to put it? 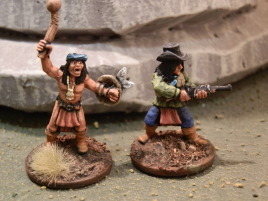 I finished the Bloodbone axemen, went out to dinner with friends and family, came back and... painted more figures! Putting in about four hours last night I got Miss Piggy's Finest into varnishing, which means they'll be finished tonight in a jiffy and then I can concentrate on celebrating New Year's Eve. Kinda anticlimactic, isn't it? Would have been more dramatic to frantically dot irises as the fireworks explode around me, wouldn't it? Well, that's what you get picking a ride with the tortoise. Final update tomorrow, then I'm going to wrap this up with all things 2014 and move on. In other news, started with Game of Thrones last night. I had trouble recognizing some of the characters with their new haircuts, but it's still as good as it ever was. The only nagging problem is the uncertainty whether all of this buildup is ever going to reach a conclusion. The profusion of new characters is not promising in that regard. Let's just say I'm no great fan on tantric storytelling. If you start something, you better know how to finish it. Happy New Year! Welcome to a warmer and slushier 2015! Well, I'm sure the weather will turn colder at some point but right now the yard is more slippery than any skating rink I've been to. 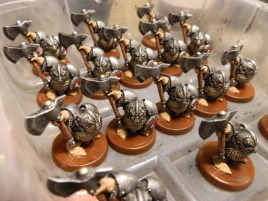 I finished off last night basing the final eight dwarfs (maybe one of them was a princess in disguise? ), which took so little time it doesn't really even count. ...No, I don't really do that. You can calm down now. This has been a very interesting experiment. Starting out I had no clear idea if this could be done, or even which figures exactly to paint. 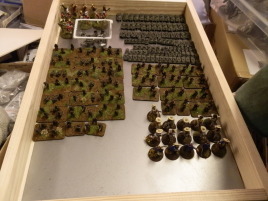 I did not plan or pre-calculate anything, though having just painted 170 figures the previous month without even really realizing it, it seemed to be within the realm of possibility. In the end hard work persevered. I worked every single day, even if only for half an hour, totalling 131 hours of painting. That's a couple of days short of a full working month (technically 147 hours I think). I didn't take time off work, I didn't skip my chores, I even managed to watch an entire 47 episode TV series during this process! If I can do this, so can anyone else who sets their mind to it. P.S. I was going to give you detailed instructions how to make the donation, but the donation site seems to be down right now. Anyway, it shouldn't be too hard, just click the link Red Cross Ebola Campaign to go to the campaign web site and follow the instructions there. They should be able to all major credit cards. They probably want to charge in euros, just find the correct conversion rate online (10 GBP is about 13 euros right now). I'll doublecheck this once the site is up again -- I owe them 14 quid as well. If for some reason you are unable to donate to Red Cross, just pick another charity. It's the thought that counts. Personally, I usually donate through the church's aid organization but unfortunately they are unable to take international credit cards. If you can make an IBAN payment, go buy a goat for your wife. She'll love it, I guarantee it. P.P.S. My trusty painting diary in use since 2006 finally ran out of pages. I need to go get another notebook.